Polymers and polymer coatings are everywhere. They give magazine pages their gloss and ensure the durability of paint used on our homes. They turn up in adhesives, carpets, athletic tracks, roofing shingles and even roads. Each application needs the polymer to behave in a particular way, and behavior is determined by composition and structure. The structure of a polymer is defined in terms of crystallinity. This might also be thought of as the degree of order or regularity in how the molecules are packed together. A well-ordered polymer is considered crystalline. The opposite is an amorphous polymer. Molecular arrangements Polymers – the materials often referred to as plastics, elastomers or rubber – are made up of long chains of molecules. In most polymers those chains comprise a backbone of carbon atoms with other atoms such as hydrogen attached at various points. The pattern by which atoms are attached is described in terms of tacticity. When arranged in a regular, repeating pattern the chain is considered isotactic but if disordered it’s atactic. Isotatic polymer chains will pack in neatly against one another, creating a fairly rigid structure. Atatic polymers are nowhere near as cooperative. Rather than interlocking they form a jumbled mess that’s often described as a looking like a bowl of spaghetti (if you have enough magnification). Crystalline structures are generally very ordered, which is what gives them strength and rigidity. Think of diamond or steel as examples. A crystalline polymer, where the molecular chains are largely locked in place against one another, is similar. Apply a load and it will break rather than bend. Amorphous polymers are the opposite. Rather than being rigid, the random molecular jumble lets the chains move across each other when the polymer is pushed or pulled. In short, amorphous polymers have flexibility and elasticity. In reality the distinction is not black or white. 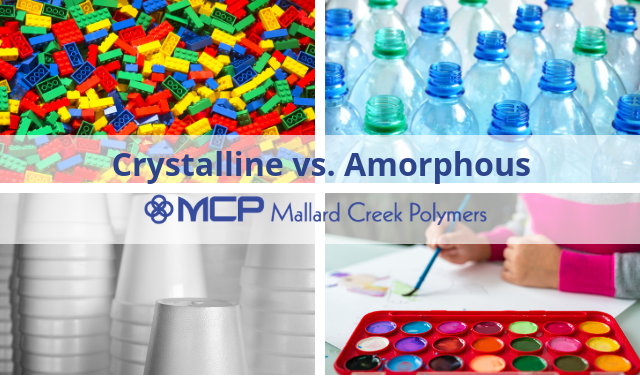 Within virtually all polymers there’s a mix of crystalline and amorphous structures. The proportion of each is influenced by how the polymer is processed, it’s composition, and temperature. An amorphous polymer might still contain 10% crystalline structures while one that’s crystalline might actually only have 80% of its structure truly ordered in a crystalline manner. Heat most crystalline structures and there’s a clear point at which they suddenly become liquid. This of course is the melting point. Amorphous polymers have no clear melting point. Instead they have a glass transition temperature or Tg. This is where the polymer transitions from rigid or solid to being soft and pliable. Crystalline structures are generally opaque because the structure acts to reflect light. One way of recognizing amorphous polymers is by their transparency. As the percentage crystallinity increases the polymer becomes progressively less clear. Polymers with higher crystallinity display opposite characteristics or behavior. Many applications of polymers and polymer coatings need flexibility at low to ambient temperatures. These are where amorphous polymers are the right choice. Conversely, when hardness and rigidity are required a polymer with greater crystallinity may be preferred.